This week, Dollar Shave Club was sold to Unilever in a deal which is rumoured to have earned its investors $1bn. So, how did they do it? Successful social media marketing is, more than anything, about firing up a shareable buzz around a brand, service or product. And Dollar Shave Club is the billion-dollar example of how to do it and how rewarding it can be. Mike Dubin and Mark Levine came up with the simple, lucrative business idea that has eluded generations of entrepreneurs: they fixed the problems men have with shaving. Their approach was to make sure they answered three, vital questions. What problems need to be fixed? How can they fix them? What’s the best way to market it? The “plastic razor fortress” – towers of cheap, plastic razors in almost every FMCG retail outlet. It was clear to Dubin and Levine, from their own experience and from anecdotes, what customers wanted. First, a great shave. Second, no overpriced “shave tech”. And third, no more inconvenient of trips to shops. While Levine wanted simply to sell razors via the web, Dubin had a passion to create a brand. They created DollarShaveClub – a subscription-type service (although Dubin prefers “club”) – enabling members to receive razors, through the mail, for $1 a month, plus shipping. 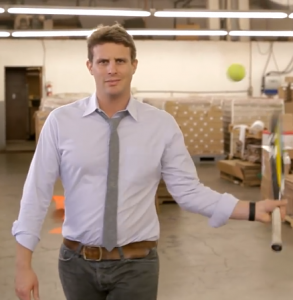 Dubin spent $35,000 on the website, DollarShaveClub.com which launched in July 2011. And he spent six months drumming up interest by talking to the media. The result was that the first 1,000 members were signed without spending a dollar on marketing. But the step change came when Dubin, leaning on his experience in comedy improv in New York, wrote and starred in a video, shot in October 2011. The video went viral, despite (or perhaps, in part, because of) its profane catch-phrase “our blades are f**king great”. It cost about $4,500 to shoot, using the company’s warehouse as the setting. Dollar Shave Club now has 3.2m customers and a turnover of $152m and is on-course to hit $200m in sales in 2016. At five-times sales, $1bn is a high price to pay for a consumer brand. But with innovative product offerings, a growing portfolio of brand-extension products and clever, viral marketing, Dollar Shave Club’s brilliant disruption has claimed 5% of the US shaving market. Which means they have an enormous opportunity for further growth.